If you spent any time at all watching the 2018 NCAA Basketball Tournament, you likely learned about Sister Jean Dolores Schmidt, the 98-year-old team chaplain and advance scout for Loyola University’s Men’s Basketball team. As Loyola’s Ramblers continued winning their way to the Final Four, Sister Jean was as much the story as the men on the court, with seemingly more media features about her influence on the team than the players or coaches, themselves. Everyone associated with Loyola’s basketball program credited Sister Jean with at least some of their collective success. 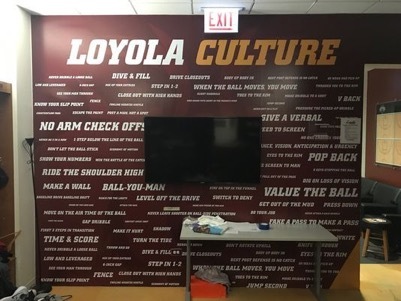 What didn’t garner nearly as much attention is Loyola’s Wall of Culture, a roughly 10‘ by 12‘ piece of sheetrock real estate inside the men’s locker room adorned with dozens of basketball behaviors written by Porter Moser, the team’s coach. Moser’s expectation is that all his players will exhibit these behaviors every moment in practice and in games. As the story goes, the wall was blank when Moser arrived on campus in 2011, providing him the perfect, highly-visible canvas upon which to paint the mosaic foundation of a high-performance culture. What Moser inherently knew is that while all good teams, sports or otherwise, are built around a set of core values and beliefs, the great ones succeed in bringing those values to life through a clear and common set of behaviors and expectations for everyone on the team. Closer examination of the Wall of Culture reveals behaviors like “Level Off The Drive,” “Value The Ball,” “When The Ball Moves, You Move,” and “Rebound Down.” These and every other behavior is studied, discussed, quizzed and practiced repeatedly by players until each becomes second nature, and when you watch a Loyola basketball game, you’ll see these behaviors alive from baseline to baseline. And that’s exactly the point. Creating high-performance teams that exemplify your desired organization culture requires investing time to identify the specific behaviors that bring your culture to life. Otherwise, you minimize your chances of achieving greatness. Think of it this way: if your culture is the skeleton, the backbone of your company, then the specific behaviors like the ones on Loyola’s Wall of Culture are the muscles that animate the bones. Want a corporate culture of Exceptional Customer Service? Work together as a team to define the specific behaviors you should see from team members when dealing with customers. Is Integrity a core value? Determine together what integrity looks like specifically in your workplace each and every day. Is Diversity one of your firm’s core principles? Then determine the specific ways each team member will conduct themselves to bring diversity to life within your team. The clearer you define the specific behaviors you expect from those on your team, the greater the likelihood you’ll see those behaviors in action in your business. And who knows? Maybe you’ll even find yourself raising your own championship banner as a result.